These may need a tweak here and there, but they are delicious! Next round we may add a little bit of coconut oil to the blueberry mixture to firm it up, but the flavor won’t change. Process those three in the food processor and press the mixture into a lined loaf pan. Process the blueberries in your food processor and then stir in your chia seeds. Pour the mixture onto your base and place in the freezer for about an hour. You want the loaf to be firm enough to cut into bite sized squares. Top the scrumptious mouthfuls with finely chopped walnuts or pecans and enjoy! 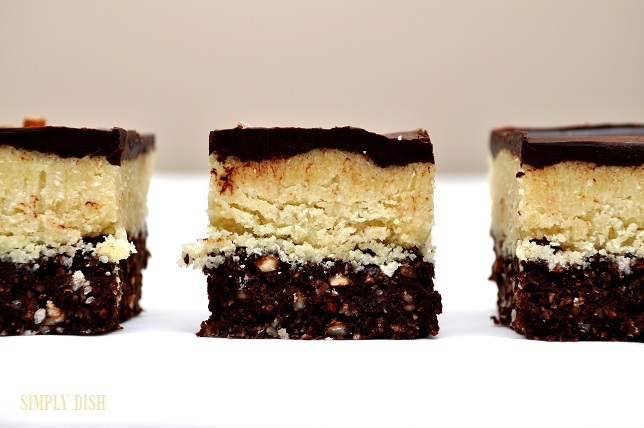 It’s no secret…we all love nanaimo bars. 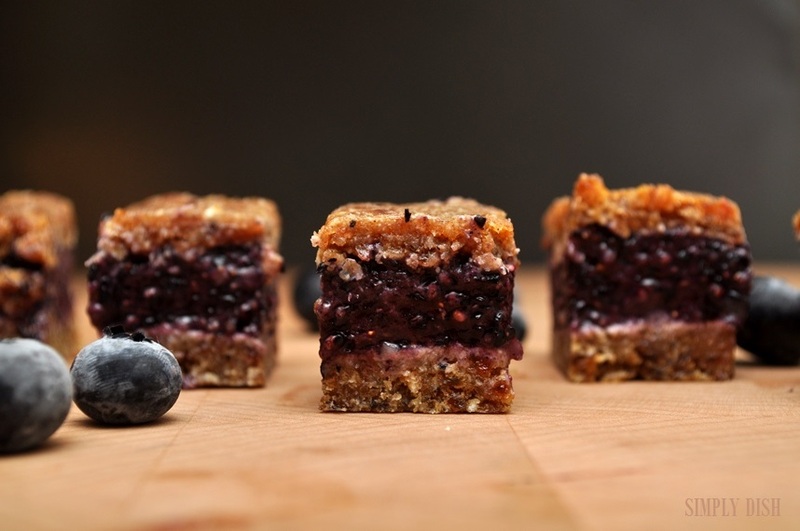 Here’s a raw, vegan, gf, nutritious and delicious version we created…and we’re so glad we did! We were fortunate enough to be offered a jar of the new Native Forest Raw – Cold Pressed coconut oil that Edward & Sons have just come out with. 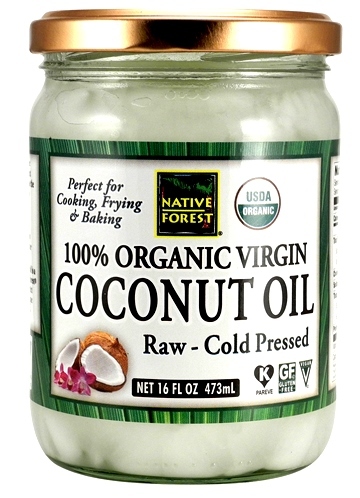 And coconut oil is such a lovely ingredient for raw desserts. It’s been a very long time, but I remember nanaimo bars being slightly complicated. I’m happy to report that these are quite simple. Before you get started, soak one cup of dates for at least four hours. Line a loaf pan with parchment paper and you’re ready to go! Process the above in your food processor until it all comes together…about thirty to forty five seconds. Press the mixture into your lined loaf pan, flatten the top and set aside. Process the first four ingredients in your food processor until smooth, remove the blade and stir in your coconut flour. Now you’re thinking…turmeric? Yep. 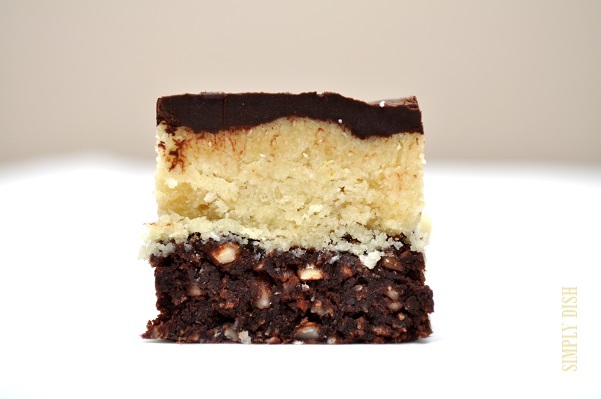 A little goes a long way and it will help you achieve the yellowy look, similar to a ‘traditional’ nanaimo bar. And I personally think it levels out the sweetness a bit. Yay! The mixture will seem a bit moist, that’s only because the coconut oil has melted from the heat of the food processor. Don’t worry, it all works out. Pour the mixture over your base and smooth out the top. Place it all in the freezer for about thirty minutes. Place the ingredients into a stainless steel bowl and rest the bowl over a pot of simmering water just long enough for the oil to melt. Give it all a good stir and drizzle it over the top of the first two layers. Because the first to layers have been in the freezer, you’ll want to spread the chocolate fairly quickly so that it doesn’t harden unevenly. Slice with a cool, dry knife and store the bars in the fridge. I don’t know that I can wait until dinner. Yep, it’s that good. We’re calling it a casserole because it’s super easy to make this one ahead and pop into the oven for dinner. We made the wild rice yesterday… a big pot of it to use throughout the week. For this recipe you’ll need two cups of cooked wild rice. This recipe will give you about four servings, but it can easily be doubled. Chop up your mushrooms and garlic and place them into a pot. Drizzle a little bit of olive oil over them and let them sizzle on medium heat for about ten minutes. Turn down the heat just a bit and add in your almond cream and nutritional yeast, followed by the two cups of cooked wild rice. Give it all a good stir and toss in your S&P. Add a little bit of fresh thyme or basil just before serving. You can either serve it right out of the pot or you can place it in a baking dish to heat up later. I was trying to make something similar to sesame snaps, but I wanted to leave out the sugar. They turned out… not so snappy. But… they are still super tasty! My five year old just asked for a third one! 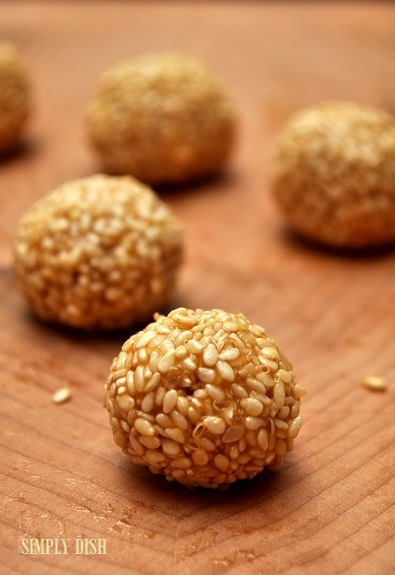 Sesame seeds are little, but they are a nutritional powerhouse. Add them to something! They’re a good source source of calcium, copper, magnesium, iron, manganese, B-complex vitamins, zinc, fiber and protein. Toss the ingredients into a bowl and get your hands in there. Speaking from experience, have a parchment lined pie plate (or something similar) ready to go. Squish it all together and roll yourself ten to twelve little balls of goodness. 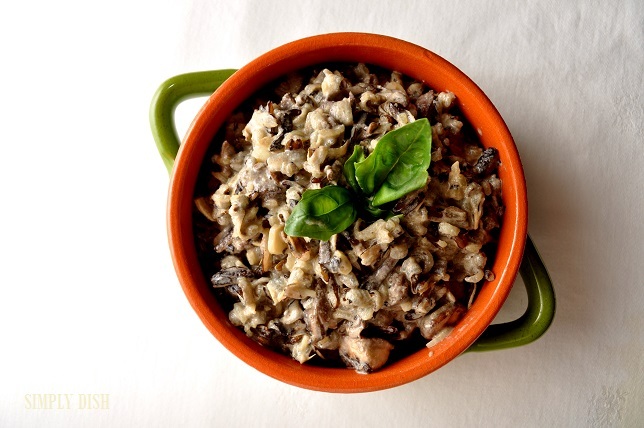 We absolutely love our wild rice, cooked. Did you know that wild rice is not actually a grain? It’s a grass! We haven’t tried eating it raw. Kinda fun! You’ll need to soak your wild rice for a couple of days – or until it cracks, but it’s worth it! Oh, and make sure to change the water daily – or twice a day. This will work with the rice cooked and cooled as well, but then it would not longer be a raw snack. Place the rice into the food processor first and give it a whiz just to break it down. Add in the remainder of the ingredients and continue to process until it’s all just combined. Test the flavor… feel free to add another tablespoon of agave if you need it a bit sweeter, but you probably won’t. All of it works quite well together. Take a pinch of the mixture and roll it into a ball. 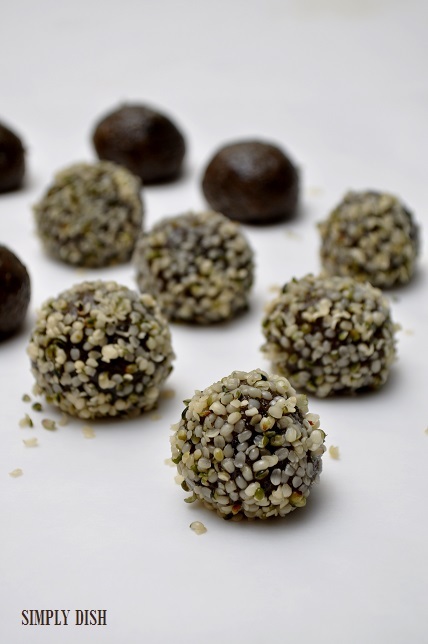 Roll that ball in a few hemp seeds for added nutrition. We placed them in the freezer for half an hour just to firm them up… and you could store them there or in the fridge. They are quite moist so you definitely want to keep them chilled. Next round we’re going to add in some unsweetened shredded coconut…or maybe some coconut flour? Great little snack to pop in your mouth when you need a quick pick me up!